Thank you Harmons for sponsoring this post. 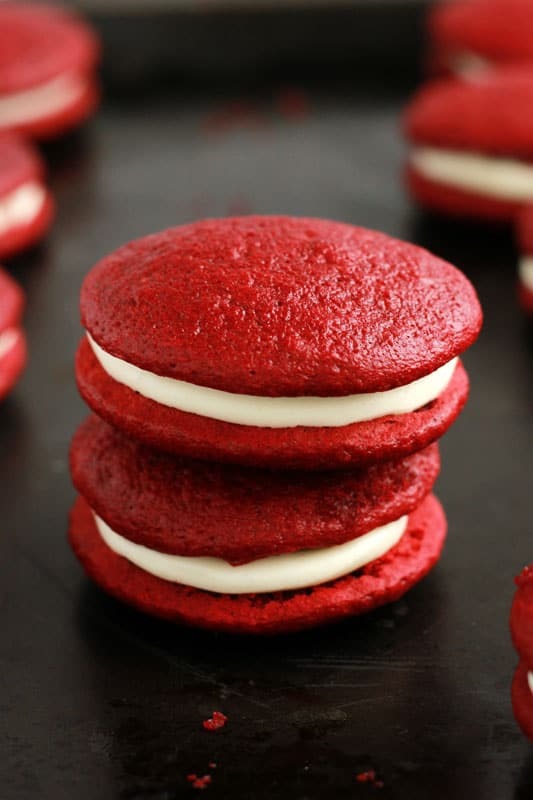 Nothing says I love you like Red Velvet Whoopie Pies filled with a sweet cream cheese frosting. At least that is what I am told by my six year old. 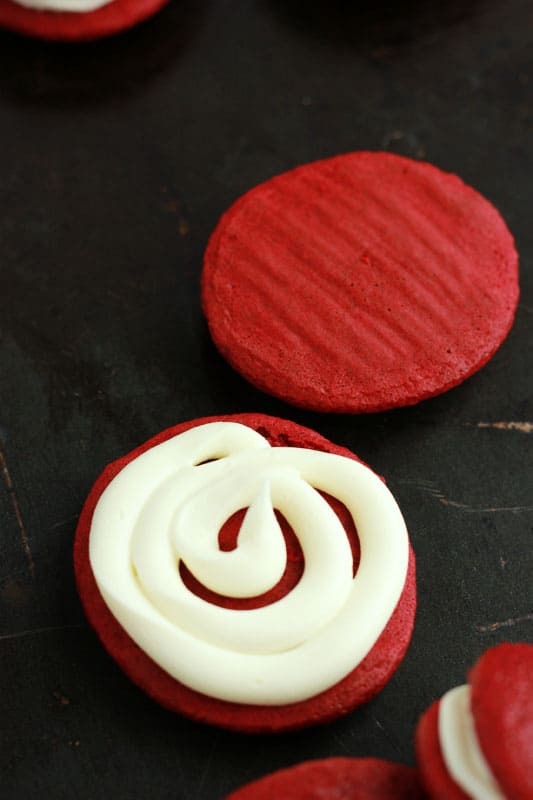 Red Velvet has become one of his all-time favorite flavors and his top request when making a little sweet. I already have cake, cupcakes, and cookies on the site and decided to take things in a new direction and create a little different. 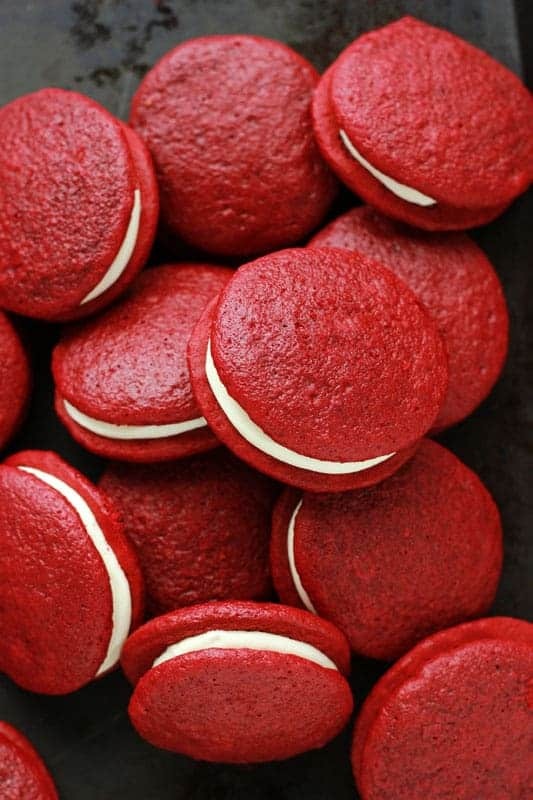 Whoopie pies are new to us and I am in love with the general idea. It is a cake AND a cookie in one which makes these little treats hard to resist. I’ll admit that these are actually just a modified cake mix. It keeps things simple which means you can go from start to finish in a snap. I had a little helper in the kitchen (follow me on snapchat: Jesseca0319 to get some of those behind the scenes peeks) and limiting the ingredients made the entire process much easier for both of us. The flavor is on point and it’s possible one or two (or ten) disappeared before we even made it to the frosting stage! Speaking of frosting… I actually used a store bought version of that too. But this isn’t just any frosting. My friends over at the Harmons Bakery helped me out with the most important part of the dessert. 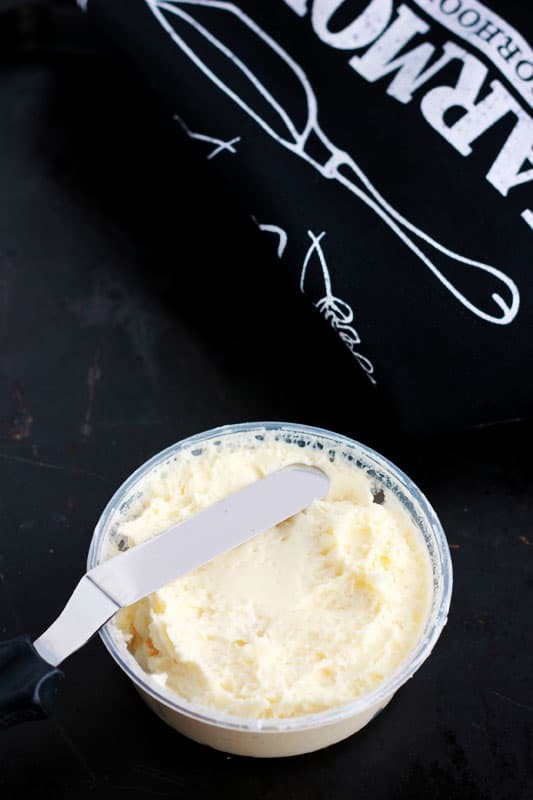 These small containers of cream cheese goodness are ALWAYS on the shelf in their store for quick cookie/cake decorating. Just head towards the bakery and ask one of the friendly staff to point you in the right direction. It is one of my faaaaaaavorite store bought frosting’s of all time. Mostly because they make it right there in the store so it is the closest thing to my own that I have been able to find. While you are wondering through that section of the store you might as well take a quick peek at the Cheesecakes, brownies, and pastries. Try not to go too crazy. Or do. You won’t regret it. Preheat your oven to 350 degrees. Line two or three cookie trays with parchment and set aside. Combine the first 5 ingredients in a large bowl. Whisk together until the batter is smooth. Drop by heaping tablespoon full onto your prepared sheets leaving at least a 2 inch space between each cookie. spread 1-2 tablespoons of frosting between 2 cookies. Continue with remaining cookies. I like to use a cookie scoop to keep each cookie uniform in size. Remember that they will expamd during baking so leave enough room for them to spread out. I made these for my primary class … They loved them. I also made chocolate ones for my son and his roommates. They were a big hit. Thanks for the recipe. You give me so many good ideas! Yay! I’m glad they worked out for you.